Purple martins are North America’s largest swallow. They are talented aerial acrobats since they seek insects as their major prey and will only eat them in flight. Over the centuries purple martins have become almost entirely dependent on people to provide nesting boxes. Such a transition is called a behavioral tradition shift. This dependence is believed to have evolved from Native Americans offering them dried gourds for housing. In return martins acted as early warning systems, alerting them to approaching visitors. Doubtless their hosts also appreciated the birds’ acrobatics, their lovely songs, and their amazing pest extermination talents. European colonists continued this tradition and by the end of the 20th century the shift was made. 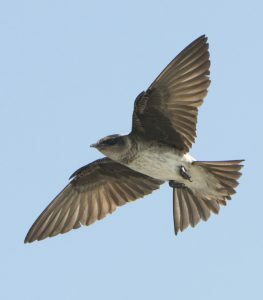 In the spring martins rely on insect hatches for food. During cold, rainy springs when hatches are not abundant the martins will often starve, because insects are sheltered and do not fly. When this occurs in April, production of young will be severely impacted. Today, people who supply purple martins with gourd racks or houses are affectionately called “landlords.” Here in Southern NJ, CU Maurice River member Allen Jackson has fostered so many purple martin landlords that we have the largest known colonies east of the Rocky Mountains. 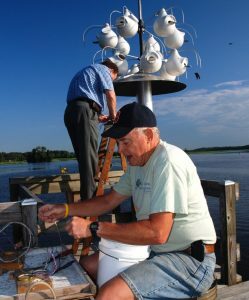 Allen Jackson, who has been our Director of Wildlife Management for a number of years, is a retired US Fish and Wildlife biologist who volunteers countless hours to the recovery of a number of avian species, with a primary focus on purple martins and bluebirds. His ability to provide technical assistance to a wide variety of organizations, National Wildlife Refuges, state wildlife management areas, state parks, military bases, environmental groups, schools, nurseries and countless individuals has resulted in a significant increase in production for these species. Allen has worked with more than 70 landlords whose gourd racks have yielded over 8,000 chicks a year! House placement and design are critical for success; Allen has found that larger gourds are superior to other types of housing. For information and ready-made structures the Purple Martin Conservation Association (PMCA) is a wonderful resource for existing colonies and budding landlords. Allen’s first successful colony was established in 1998. To attract the birds initially, he played a recording of purple martins singing their dawn song. Within 15 minutes he had the great fortune of securing a pair. By 2002 the custard stand’s field, where he had these first arrivals, was 43-pair strong! 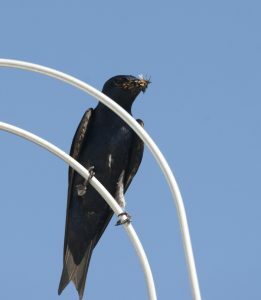 Since then Allen has fostered interest in establishing colonies in every imaginable place that provides the proper habitat to support purple martins. CU Maurice River’s martin landlords are a formidable component of this success story. For a number of years we supplied 8000 bands for chicks. Allen abandoned this effort when data loggers became state-of-the-art for tracking bird movements and banding was no longer necessary. Today Allen attributes his success to the expertise acquired through the PMCA. And the PMCA attributes a portion of their success to Allen. As a biologist Allen knows that proper management techniques are key to success.